We would like to personally welcome you to our Online Superstore. Our number one goal is to create an experience that will rival the best in any industry. We know that making a purchase from a local retailer or from an online website can be a frustrating, and at times, scary ordeal. Your experience with us will be neither of those. Whether you are making an investment from one of our local Arizona Retail Stores or from our Online Superstore, we hope to create the best shopping experience possible. At Home Fitness is one of the premier specialty fitness dealers in the country. We exclusively offer the highest rated, best value products available in this industry. Combine that with a company that is committed to excellence and you will see why we will make this an experience second to none. We want to make sure that your experience is enjoyable from start to finish. 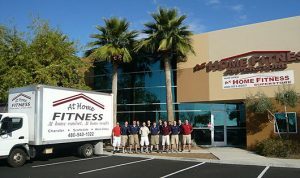 One important key feature of our company is that we have retail stores in Arizona, with locations in Scottsdale, Gilbert and Ahwatukee (Phoenix). We are not a fly-by-night E-commerce site that is here today, gone tomorrow. We have a reputation to uphold in this industry and we will make sure you are satisfied. The exercise equipment we sell is exclusive to us and we have worked extremely hard to earn the distribution rights to represent these products. Just like you have high expectations for service, so do we. If you have any questions before, during or after your buying experience, we encourage you to call our stores and work directly with a knowledgeable and friendly fitness consultant. These are not operators; these are experienced fitness consultants who will be extremely familiar with the fitness products you are inquiring about. We will help you choose the perfect exercise equipment to help you achieve your fitness goals.